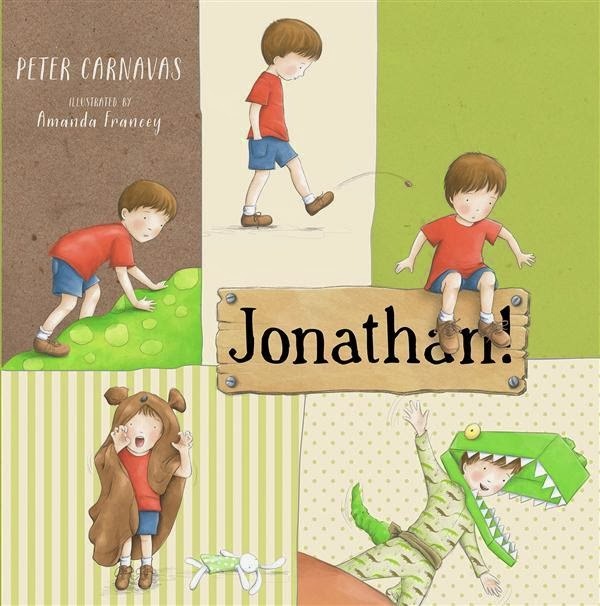 Jonathon is a beautifully illustrated, full colour picture book for the 3- 5 year old age group. This is one of those books that is a pleasure to read to younger children as it has plenty of opportunity for sound effects as we move through the story. Jonathan disguises himself as various creatures. ROAR! calls Jonathan the lion. SNAP! he calls when he’s dressed up as a crocodile. GROWL! calls Jonathan when he is dressed in a blanket like make believe bear. Jonathan tries to scare Dad, his sister and Mum, but no one is interested. Jonathan goes for a walk, he meets to his surprise a friendly dinosaur, so they team up to go to Jonathan’s house to see if they can scare anyone there this time. BOO! says the dinosaur when the front door is opened by Dad, Mum and his sister. The family scream, then flee the house. Jonathan thanks the Dinosaur and tells him he can go now when suddenly the dinosaur says BOO! The dinosaur takes off what turns out to be a costume and reveals…it’s Jonathan’s grandad! A simple story, a happy ending, this is a lovely book for parents, grandparents and early readers to read and enjoy.